priPrinter is a printer driver that allows you to manipulate printer output before it is printed. 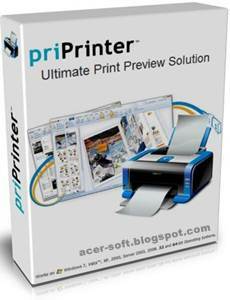 priPrinter is installed and selected in the same way as other printer drivers. After printing it automatically displays print preview where you can preview your printings, change layout, reposition pages, crop them and many more. After that you print it to the real printer or save your document for later using. With priPrinter you always will be sure how your printings will look. You may measure items on the paper, define margins and pages layout. There is no need to print again and again trying to achieve desired placement. » Provides every feature you need to make your print easy and simple. » Preview your printing in many ways. Explore content of your jobs. » Print to images. You may save your prints to various image formats. » Margins and gutters. Change margins and gutters with mouse click and drag. » Crop and Cut. Remove blank space and redundant information. » Save jobs to file. • Works on Windows 7, Windows Vista™, Windows® XP, Windows® 2000 and Windows® Server 2003. • 32 and 64-bit versions. ould be used for fast theme selection.